Let The Pig Breeding Experimentation Begin! 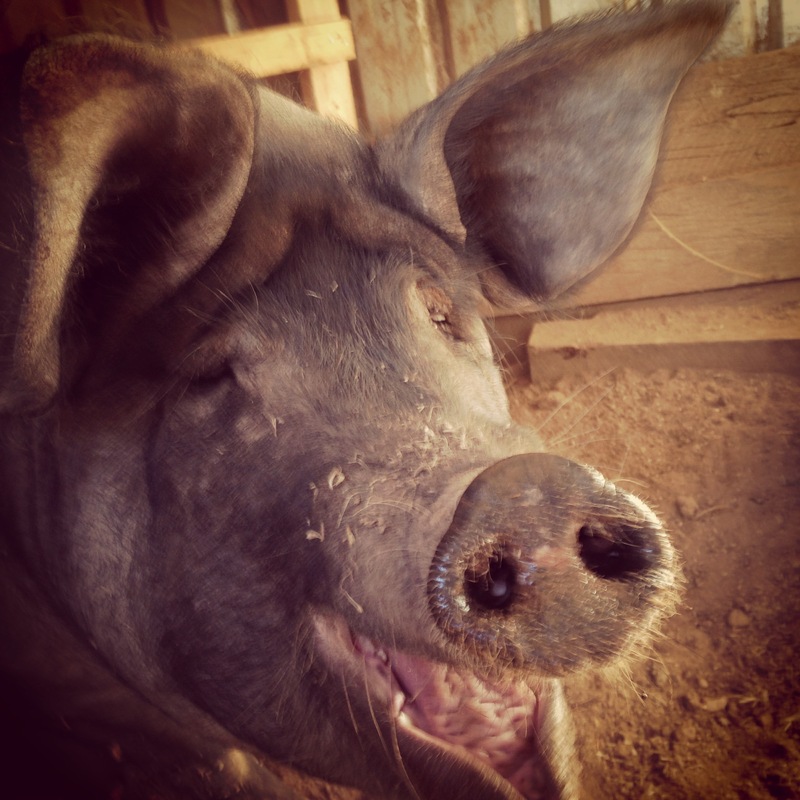 Back in April last year we acquired our first heritage breed pigs. 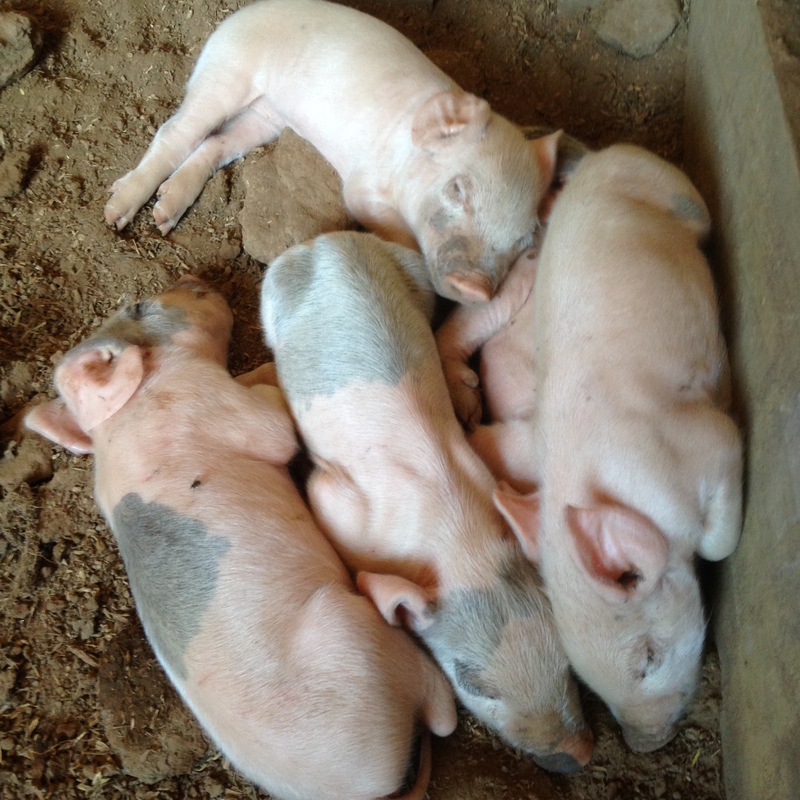 They were 3 piglets around 4 months old, and we bought 2 girls and 1 boy. Initially we wanted to use the boy as a spit-pig but feed his sisters on as baconers. However, we decided to keep the girls as breeders to see how they went. The father of these piglets was pure Large Black and the mum was pure Berkshire. They were both huge, and both just lovely, friendly pigs. The weird thing is that the two girls, despite being litter-mates, look like different breeds. Miss Swan looks like a Large Black, not surprisingly being giant and entirely black, while Socks looks like a Berkshire, being smaller and having a white star/blaze and 4 white feet. It’s fascinating thinking about how they came from the same litter, and yet identify genetically with different parents. Anyway, we wanted to put our boar, Boris, over them. Boris a Large White/Landrace cross, though I think he tends to favour the Landrace side. At around 9 months old both of these girls was large enough to take Boris so we put all three of them in together. They lived together for between 2 and 3 months, and I’m confident for at least a full three seasons. Not to put too fine a point on it, but this is Boris doing his job and doing it well! We thought the girls were in season when we decided to put them all in together. We’re getting pretty good at picking that, though to be honest the sows are none-too-subtle about it. We saw them couple pretty much right away, as evidenced by the picture above. We saw Boris couple with both girls and so figured they’d both be pregnant at the same time and drop around the same time. We want to farrow the girls in pairs. We’ve tried farrowing them truly together with some fairly disastrous results. Our plan now is to have them drop in pairs, keep the mums separate for a week or two, and then have them all in together. This will help us foster babies if we need to, and the mums just like to have company. We monitored the girls for the next couple of months, and didn’t see them come into season again or couple with Boris. This is the tricky part though, as we’re not out there all day and so can’t watch them 24/7. However, like I said, an in-heat sow isn’t subtle and we were sure we’d see it if it were to happen. As it turns out, we were wrong. While this cross-breeding is experimental to us, it’s obviously been done before. The offspring of the white/black crosses are called Blue Merles, and I don’t think that term is limited to pigs but counts for a number of species. 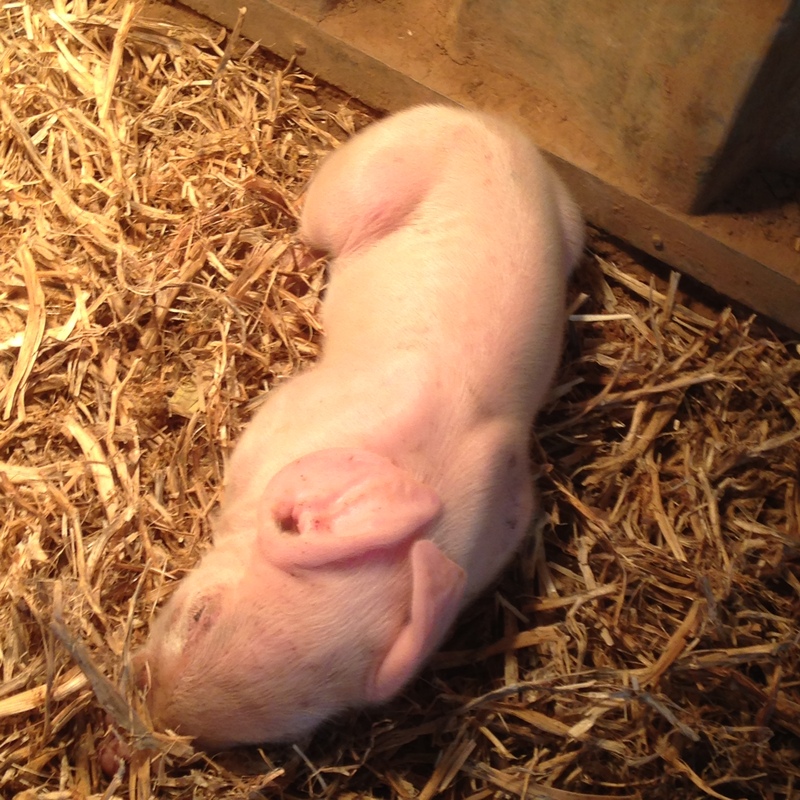 Commercially, the Large White/Landrace sows are favoured because they have lots of babies and produce lots of milk. They then finish that line off (Terminal Sire Line) with Durocs to give the boofy offspring that grow quickly and give good hams etc. The heritage breeds, on the other hand, have smaller litters, but the meat is better quality, having better marbling and depth-of-flavour. I wanted to see if Blue Merle pigs would give us the best of both worlds. As a side note, I’m not hung up on the heritage breeds. People will bang on about them, and there’s no doubt they’re lovely pigs and well worth saving as breeds. However, there are many people growing them now, so the breeds aren’t in danger. 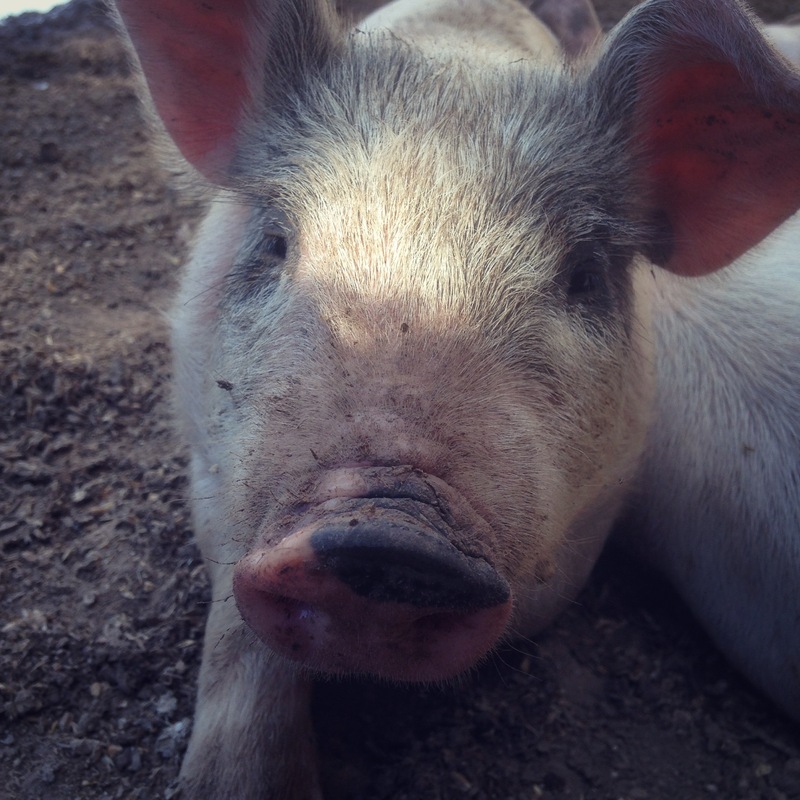 To me, the ethical part of raising any animal for food, be it pigs or something else, is in how they’re raised. I’m happy to raise white, black, or spotted pigs. Having said that, the brother of Miss Swan and Socks (George) was noticeably tastier, so we were keen to experiment with the black breeds. I’d never dump my white girls and replace them with heritage breed sows, but I would phase them out depending on how our cross-breeding experiments go. You’ll also hear that the black breeds are better for free-ranging as they handle the heat better. That’s only half true. They certainly don’t get sunburned, which is a bonus, but they get heat stressed much faster. That actually stands to reason if you think about it. White reflects heat and black absorbs it, so our black girls will be panting and in need of a soaking much quicker than our white girls. We’re also working on a home-made sunburn remedy for our girls involving the copious amounts of aloe vera we grow. I’ll post about that should we work it out. We’re getting quite good at picking when the white girls are going to drop just by looking at them – their stomachs drop and their teats fill out. I keep a spreadsheet recording all of the matings and births, so we have a good idea when they’re due, but we can pretty much pick it visually now. That’s a little harder with the black girls, as they don’t have as much milk. With all of that in mind, we were struggling getting closer to the due date of our black girls. About a week out I was sure that Miss Swan was due shortly, but I wasn’t even sure that Socks was pregnant. She’s much smaller than Swan, and just didn’t show the signs that the white girls do. Based on when we saw them mate their earliest due date was January 24th. They’re pregnant for 112 to 114 days. They’re also in a heat for a few days, and can mate across that entire period. That means we can only estimate their earliest due date, but it can actually be several days later. In this case, Miss Swan dropped on January 27th, giving us 5 gorgeous babies. This is Dumbo. No prizes for guessing where his name comes from. 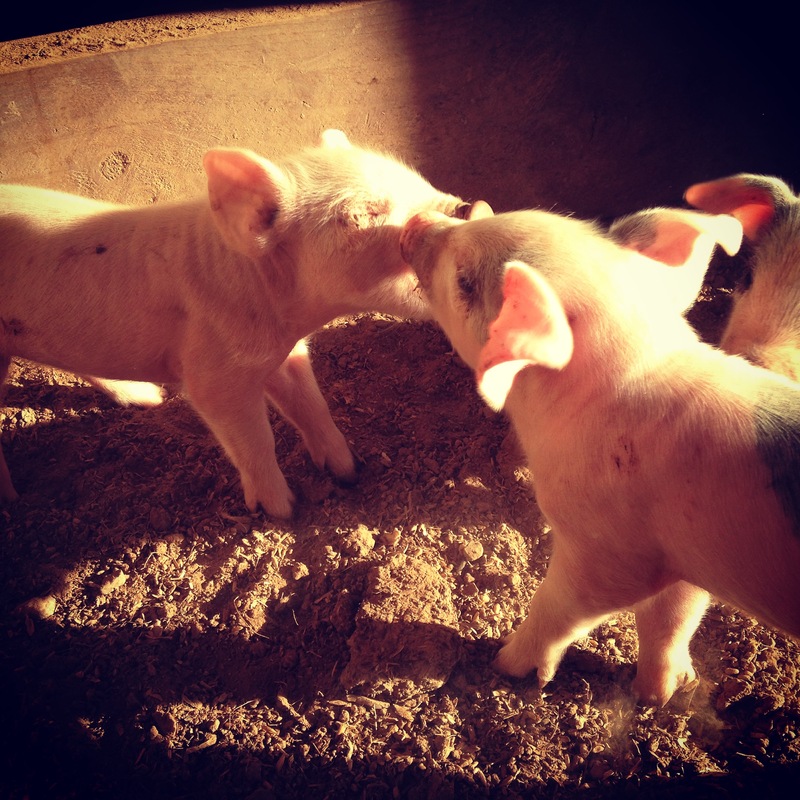 This might look like cute piglets kissing but it’s actually cute piglets beating the hell out of each other. This entire experience was fascinating to me. First of all, Swan is a very large pig, and not yet fully grown, and she gave us only 5 babies. First litters are often smaller, though we had a white girl drop 13 her first time, and the heritage breeds normally have smaller litter sizes. I was happy with that, and would have no problem with smaller litters if the result is a better grade of meat. In this case there was also 4 girls and 1 boy, which is a great ratio. We much prefer girls, so 80% was perfect. The other thing that struck me was their colour. The 4 girls were spotty, and a few had patches over their faces which were adorable, but the boy came out almost entirely white. I thought that was cool, and we gave the girls pirate-themed names (Captain, Jack, Sparrow, and Chang). However, at four weeks old the boy (Dumbo) has half his back covered in black spots. They clearly develop their colours as they grow, and I had never read about that anywhere. This is Captain at nearly 4 weeks old. She’s a sweety! The last thing of note with these piglets is their size. At 4 weeks old they are super boofy in the shoulders and really quite large. 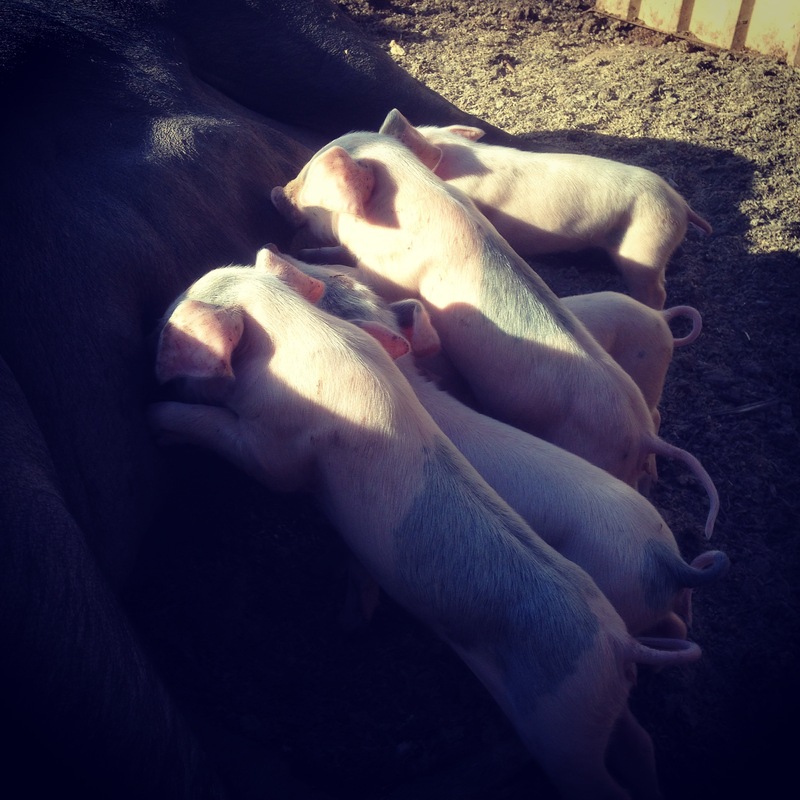 They are easily the best piglets we’ve ever had, and I have high hopes for the quality of the pork. This is at just shy of 4 weeks. 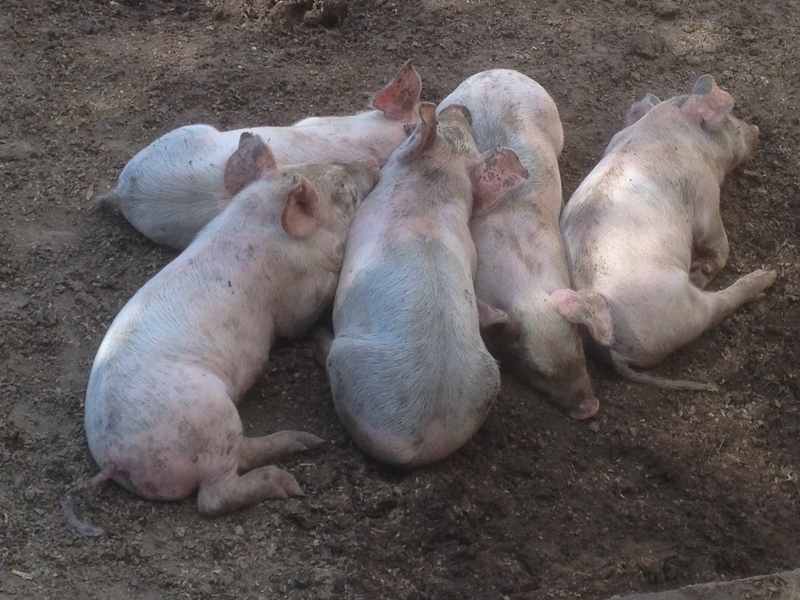 There’s no real frame of reference, but they’re the largest piglets we’ve ever had. Though we’ve not tried the meat yet, I’m confident that this experiment has worked well. While I’m not going to race out and swap our white girls for heritage breeds, I may swap our boar out for a Large Black. Miss Swan doing it for the lolz. Oh, and Socks obviously didn’t drop at the same time as her sister. It was only when her sister dropped that I was confident that Socks was even pregnant. At the time we figured she was probably a fully cycle out from her sister, meaning she’d be due 3 weeks later. I’m going to save that for another blog entry though, as Socks’ litter was even more surprising!